Sunday was our monthly BRR ride and after a week of rain and a really nasty Saturday (weather-wise) it was nice to rise to a grey but fine day. 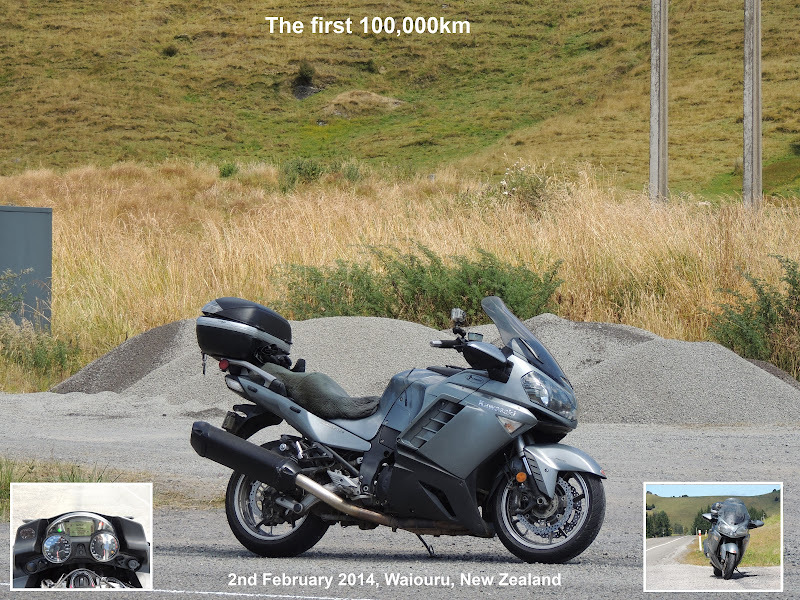 I was up early and after fueling up in town started off on my way to our rendezvous in Wanganui. The trip over was pretty boring and I just cruised it with my Ipod on and the Vee pretty much on auto-pilot. I bet Neil to the service station by the time it takes to pump and pay for 4.3L of 91 and we rode across to the cafe for a coffee while we waited for the rest of the crew. Soon our numbers started to grow but when the appointed departure time came around we were still missing a couple of dodgy characters. Just as we were suiting up Neil's phone went off and the dodgy characters were on the other end of the line wondering where we were. Some quick explanations and they were soon on the way to catch up with us. One of them had even swapped bikes since the last ride so we were forced to ooh and ahh at the 2nd of two brand spankers 800GSA's on the ride. Finally sorted with all present and accounted for we took off aiming for the Parapara's. 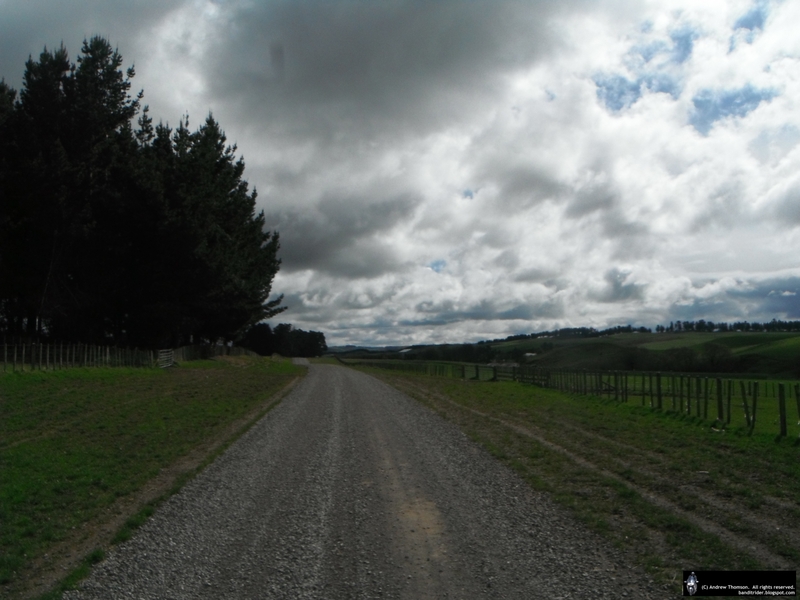 But as this was a gravel ride we didn't get to ride all the way through to Raetihi instead pulling off for our first section of gravel on Te Rimu Road. 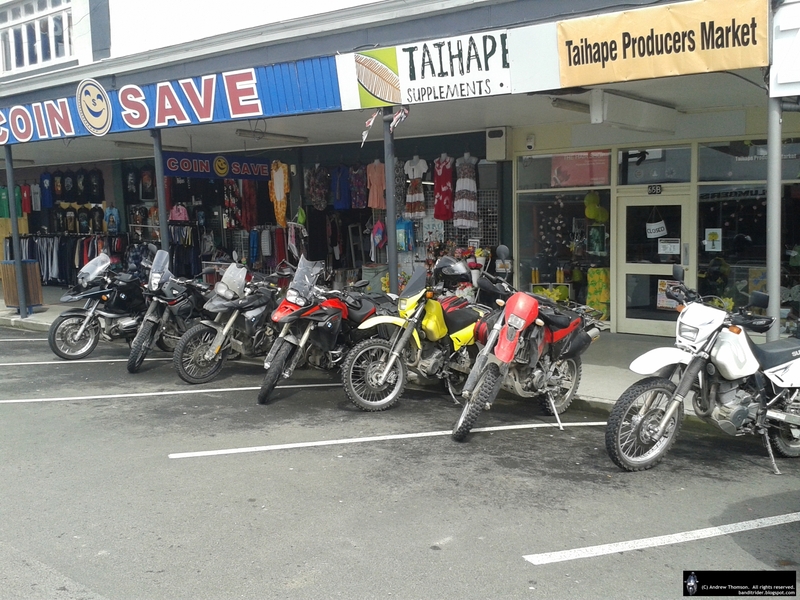 Te Rimu Road was a lot of fun although we did get held up by a couple of 4 wheeled contraptions and have to dodge a lot of stock. There were also a couple of sections with puddles and small slips to add to the excitement. Te Rimu road spat us out onto Mangamahu Road which initially was sealed until we hit some really fantastic gravel. 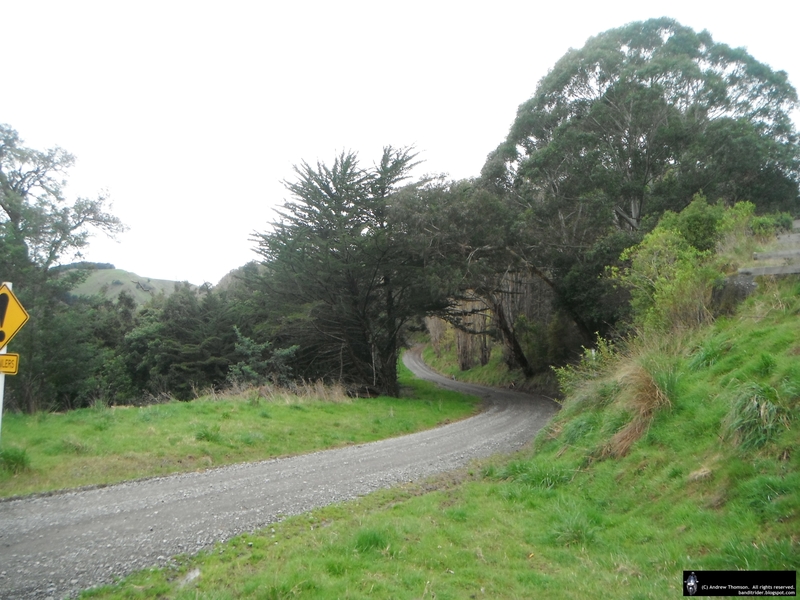 After this wee break there was more great gravel riding up Whangaehu Valley Road but it eventually ran out when we hit Fields Track. A nice squirt on the tarmac took us past the big slip (which I'm guessing was what had shut Fields Track off for a while some months back) and to our next gravel road turn-off - Owhakura Road. 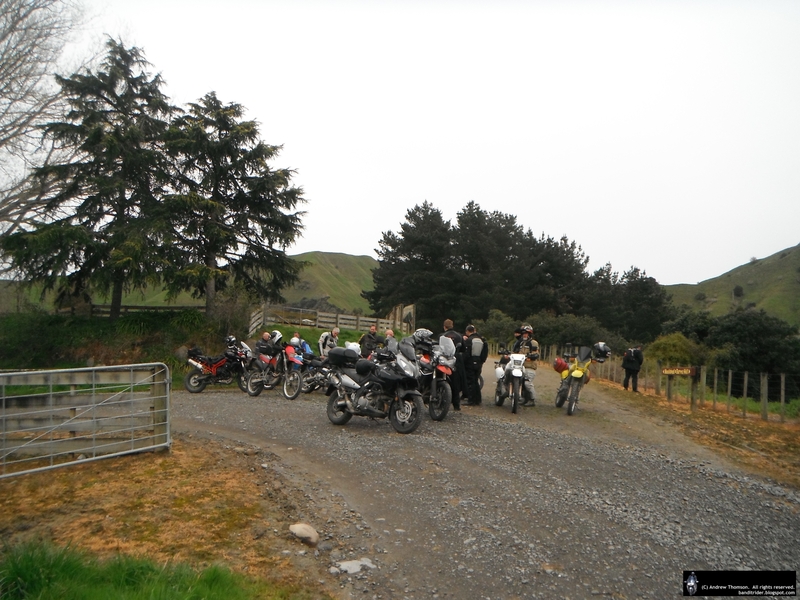 At Bells Junction we rejoined the tarseal for the ride across to SH1 and our ride into Taihape for lunch. 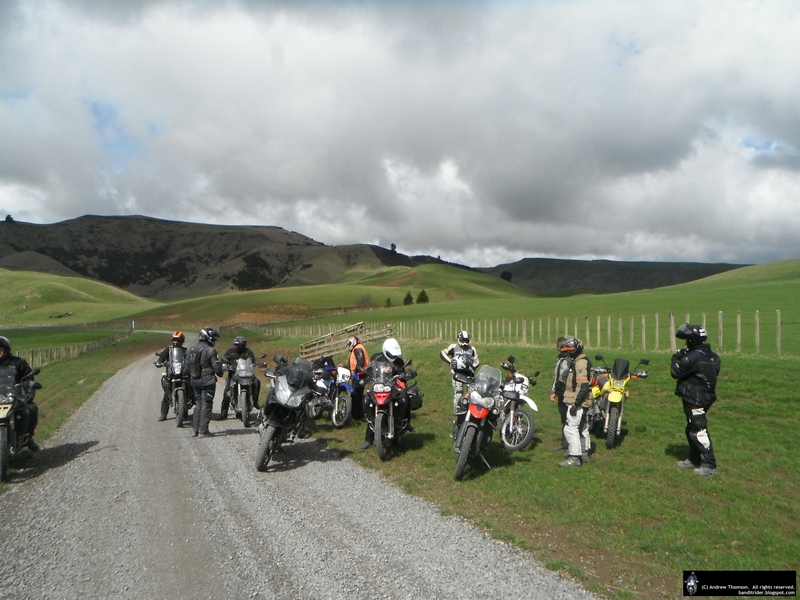 After lunch we topped off our tanks and headed out towards the Napier-Taihape Road. Neil was enjoying the tarseal twisties so much that he missed our first turn-off and we had to double back to find the fabulous Waikakahi Road - great fast gravel. 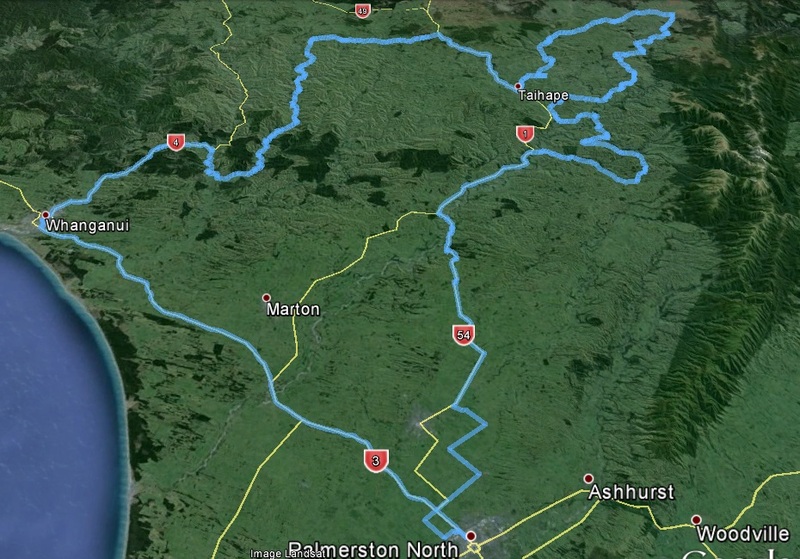 Waikakahi Road led us onto the Napier-Taihape proper and another fun section of tar. Eventually though we got to the turn off onto Mangaohane Road. There was a lot less snow around than last time I was up there but the road was still in fantastic condition. Unfortunately my rear tyre is not in fantastic condition so in some of the thicker stuff I was having a little trouble hooking up - it made things fairly entertaining though. More gravel took us through to Taoroa Junction where we turned and started to make for SH1 but rather than give up on the gravel we turned back again and hit some more on Tuhoe Road. 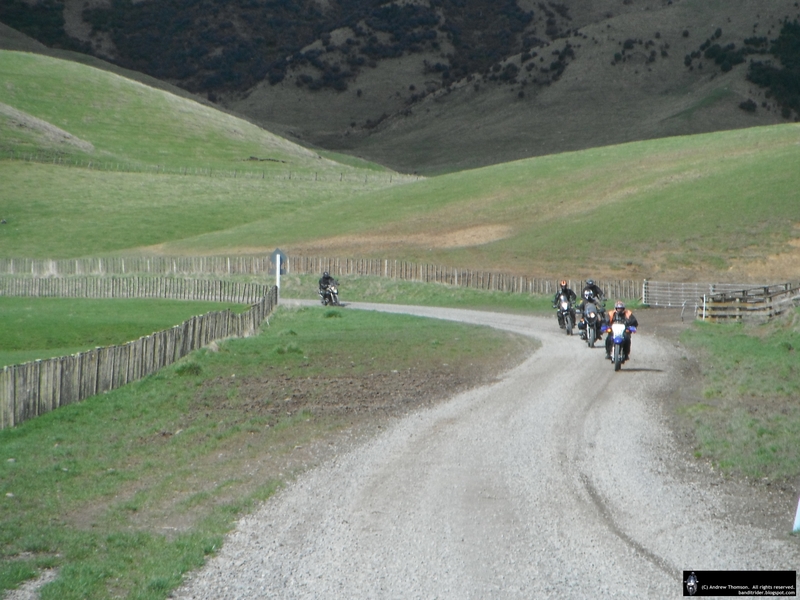 Tuhoe Road eventually came to an end and we carried on generally Southwards on a mixture of tarseal and gravel roads. It was crossing a little bridge on one of these roads that I had my little bit of excitement for the day. 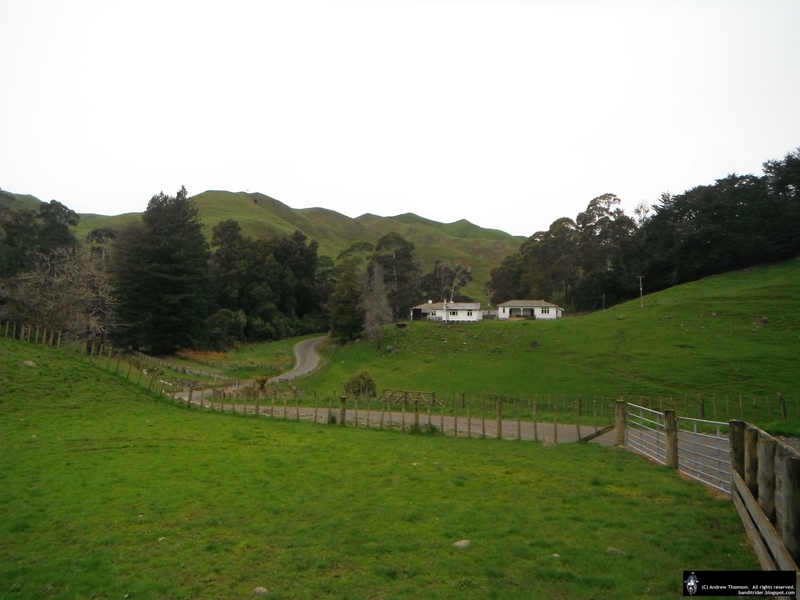 Eventually all the fun had to end as we hit the Rangiwahia Road and pootled onto Mangaweka (I shoulda gone left towards Kimbolton instead of right to Mangaweka) where we went our separate ways. A boring stretch on SH1 followed by a squirt over Vinegar Hill had me home just before 5 after a great day out on the Vee! Neil recently got his speedy registered again and yesterday fitted a new front tyre to it and was using this as an excuse to persuade me to go on a mission to check out Ted and his banged up leg (or perhaps that was just the excuse for a ride?). I ummed and arrded for a bit yesterday but eventually put a bit of air in the tyres and got ready just in case I decided to tag along. I set my alarm for 6am so naturally was up having brekkie by 5:30 and on the road at about 6:30. Heading out of town under overcast skies the roads were wet but the rain stayed away as I made my way over Vinegar Hill. I had one little scare when a truck came around the corner with a small shed hanging off it. Definitely a wide-load and I was glad I was on a bike not in the car - he seriously should have had a pilot vehicle in front. Just North of Mangaweka I rode into a light rain and it also got a bit chillier. I only had my thin gloves on and by the time I was in Taihape the rain had got a little bit more serious and my hands were getting a tad damp. The weather in Waiouru was no better and as I made my way across to Ohakune the visibility also became a lot worse - the clouds were sticking pretty close to the ground for some reason. 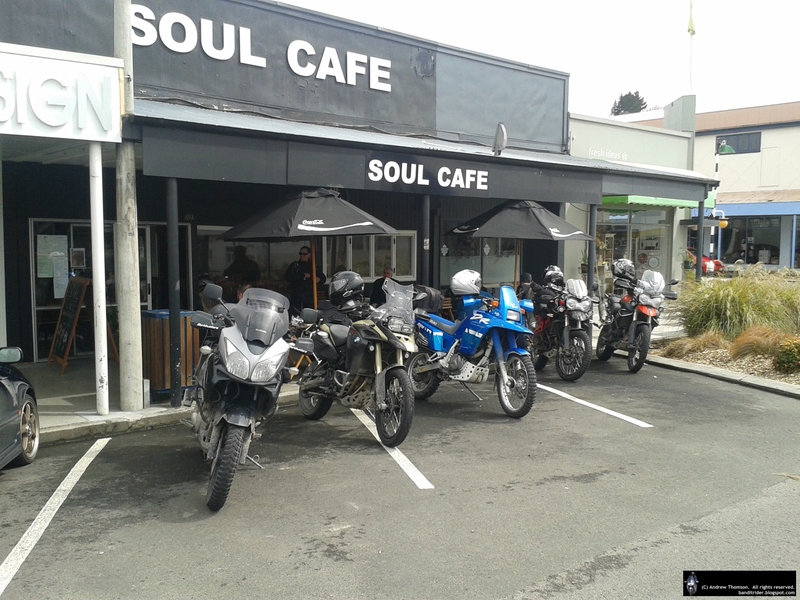 I rolled up at Neil's bang on 8:30 and after a bit of fluffing around he was geared up and ready to lead the way to Taumarunui for a quick fuel stop. The ride through 8 mile was fairly wet but still a lot of fun. It's a great bit of road but obviously had got the better of someone - as we dropped down a hill we couldn't help but noticing that a corolla had gone through a fence and was perched on top of a grassy hill. They were quite lucky and must have scrubbed off a bit of speed prior to their off - any faster and they would have disappeared over the side of the hill and ended up down in a gully. A cop was on the scene but must not have had much in the way of emergency signs etc as he had put out his "breathalyzer check point" sign. We ignored it and carried on our merry (if damp) way. A few more miles up the road got us into Piopio where it was time to stop to feed Neil's worms and grab a hot drink. I even managed to force down a piece of bacon and egg pie. From Piopio Neil led us off out the western side of the main road on some great back roads. I'd done a number of these on a Grand Challenge years ago but he still managed to find some that I hadn't done. By now it had stopped raining but the roads were still wet and the surface a little dodgy in places but otherwise the roads were magic - plenty of nice curves to get the sides of the tyres working. 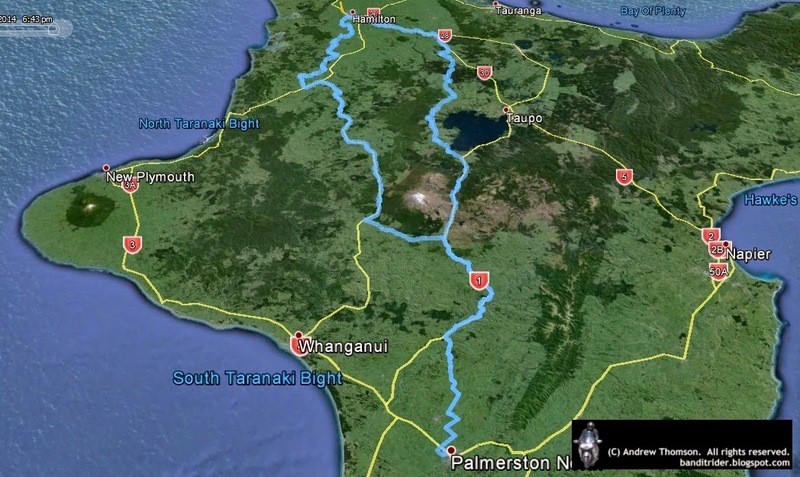 I've got no real idea how we got from Pirongia to Hamilton - Neil had us turning left and right all over the place and I wouldn't really have been surprised to end up in Invercargill, but no, we actually did find Hamilton and soon were checking out the cast on Ted's hoof. Ted seemed in pretty good spirits and even showed us the fancy farkle on his Tiger which enables him to carry his crutches...don't tell his missus! Having sufficiently wound-up Ted we split at about 2ish for the return trip. Rather than take the same route back we made our way down SH1 (yuck) to Karipiro where we fuelled up again for the next leg. One highlight was seeing 4 gorgeous Lamborghini's go past heading North - unfortunately they were being well behaved so we didn't get to see or hear them being driven as intended. 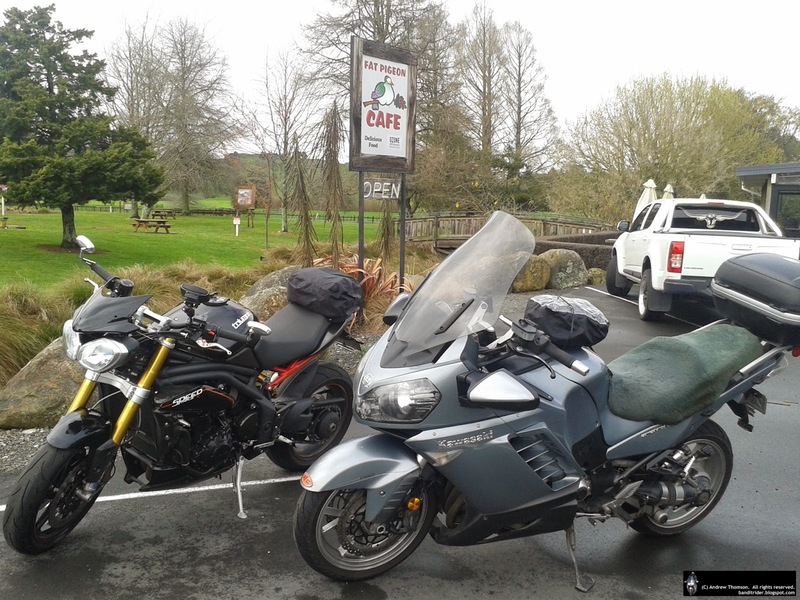 At Lichfield we turned off and hooked up with Old Taupo Road for a nice squirt on mostly dry roads to Whakamaru and then onto Turangi. Here I tooted to Neil as he went in search of worm tucker and I carried on towards the Desert Road. By the time I hit Vinegar Hill it was starting to get a little dark and it was a bit difficult to tell which corners were wet and slippery so I took it fairly quietly. I rolled up the drive at about 6:40 after a fun little jaunt of about 850km. One of the better ways to spend a Sunday! So today I undid a some of the work I did last weekend but have ended up with an even better result. As I've mentioned before I would have preferred to be able to setup my little tank-bag so it can fit both bikes and contain all the electrical dohickeys that I might need on the road. Until now I hadn't been able to make the tank-bag work on the Connie as it wanted to sit on the built-in glove-box which meant it couldn't clip into the retaining ring. Today I rustled up a spacer to go between the tank bag and the top ring which then fits onto the bottom ring mounted on the fuel tank. I cut this out of a piece of nice thick plastic and bolted it to the tank bag. I still had a little issue with the pin which holds the two rings together hitting the glove-box. A couple of washer for a bit more packing on the bottom ring sorted this out. Then, just because I could I swapped the two 12v sockets that were in the tank-bag for the new setup I bought last week. Now there is one 12v socket and the dual usb charger in the bag. I can still plug in one of the twin plug usb chargers into the 12v socket if I need more than 2 usb devices charging at once. I also removed the switch from the system as the Connie's accessory power is switched already - I will also change the wiring on the V-Strom so it has switched power too as I don't think I need the bag to be hot all the time. The next thing I had to do was to wire in a quick release plug inside the glove-box. Now the plug from the tank bag can be passed into the glove-box (the lid can still close) and plugged into the ergs. A while ago I electrified the tank bag I use on the V-Strom and had hoped that I'd be able to use the same setup on the Connie too. First up was where to get the power from? The Connie comes with two sets of accessory plugs. One set is under the left hand side fairing right up nice and close to where I needed it but my hot grips are wired into them so I decided to go for the second set which is away back under the seat. First I had to find them...thankfully the interweb was my friend. The next mission was to do a nice cable run to get the wiring to the glove-box. This involved lifting the tank a tad and removing some fairing screws to allow me to poke around. It was a bit of a mission but you can't even see the wire unless you start taking the bike to bits. I then made up a small plastic plate (out of some recycled plastic) to mount the charger in. Boring the hole was the tricky bit as I don't own any hole saws (must fix that) but I got there in the end and even painted the plate up before fitting the charger. Then it was time for the install. Hopefully that blue led means all is good in the world. And I didn't even blow anything up! One happy camper.